to Get Useful Information About Your Virginia DUI Case! If you’ve been charged with a DUI (Driving Under the Influence) and/or DWI (Driving While Impaired), you know what a nerve-wracking experience it can be. With the police, the prosecutor and possibly even the court warning you about the dire consequences of a DUI/DWI conviction, the situation can feel hopeless. I’m here to tell you it’s not. 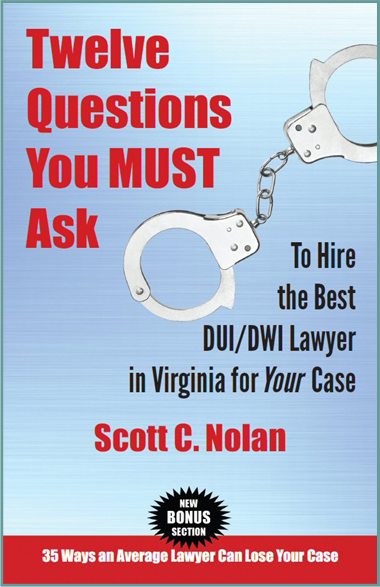 ● How do I choose a GREAT Virginia DUI/DWI lawyer? ● How can an average lawyer lose my case for me? Searching for a Virginia DUI Attorney and Not Impressed With What You’ve Found So Far? I want to actually provide you with real, useful information about DUI, so that you can make smart decisions about your case. Want to learn about your case before calling me? Read my report, Twelve Questions You MUST Ask to Hire the Best Virginia DUI Lawyer for Your Case.